Size: Plate is over 20" tall, frond is over 16" long! This is a textbook plant fossil. It is a HUGE fossil fern frond from Pennsylvania. This specimen was collected in the 1970's by one collector, who then died with the locality info and the only lot of this material ever found in his collection. Many collectors have tried to rediscover this locality, but to no avail. The reason this material is coveted by collectors is the rich NATURAL color/contrast of the fossils, the incredible minute details, and the completeness of the fronds. At most sites in Pennsylvania, only frondlets are found - but as you see here, this locality produced a few full fronds. The gigantic frond (OVER SIXTEEN INCHES LONG!) has amazing detail preserved - all of the individual frondlets are easily seen. The natural color and contrast is simply beautiful, and the fern displays very well on the large, natural plate of coalshale. 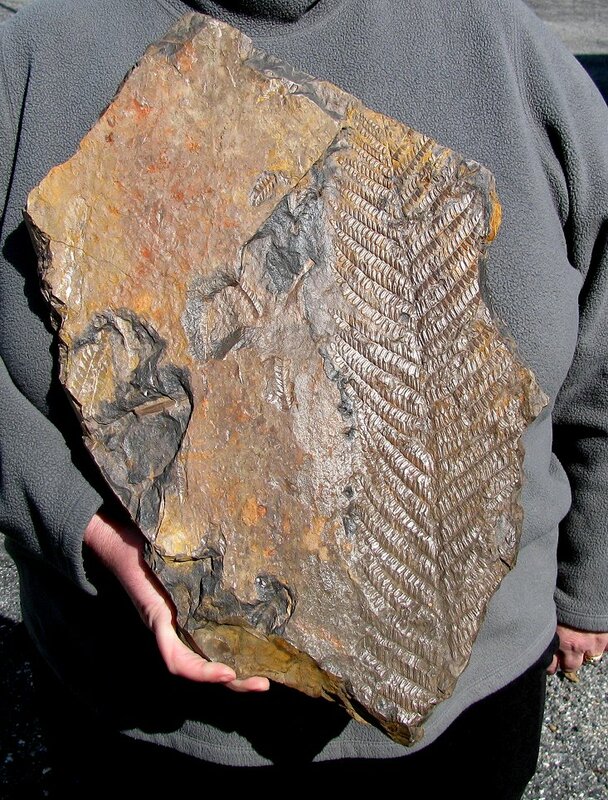 Also, the back side of the plate reveals an extremely rare Neuropteris frond - usually, only single, individual fingerprint-patterned leaves are found. Here, there is a large, entire frond is preserved, and the textbook fingerprint pattern of each leaf is very easily seen! (see photo) This is a HUGE example of an extremely collectible and extremely displayable fossil fern frond from the lost site at "Coal Valley, Schuylkill Co., PA".